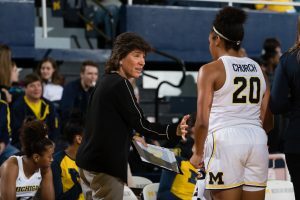 New Mexico’s Yvonne Sanchez is currently an assistant coach at Michigan. This season was her first year in Ann Arbor. 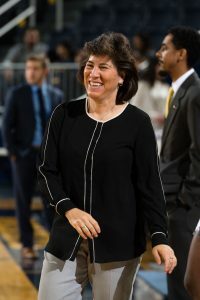 Sanchez was on staff at the University of New Mexico from 2000-2016, spending the last five seasons of her tenure as head coach. Basketball fans might also know her from a successful high school career in the Land of Enchantment. 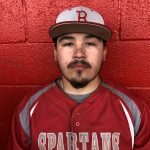 Sanchez led Eldorado High School to a state-record 74 consecutive wins and two 4A titles before earning 4A Player of the Year honors by the Albuquerque Journal. 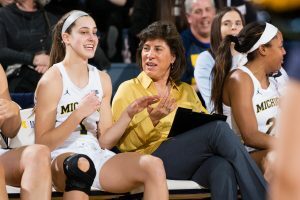 J.P. Murrieta sat down with Sanchez to discuss her former and current basketball coaching career. 12/21/18 The 2018-19 Women’s Basketball team defeats Southern University, 76-35 in non-conference finale. 12/6/18 The 2018-19 Women’s Basketball team defeats LIU Brooklyn, 83-38.